After over a decade of talks, a final deal on Iran’s nuclear programme was agreed in July 2015. Under the agreement, Iran will accept some restrictions in return for the easing of economic sanctions. 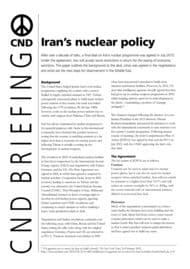 This paper outlines the background to the deal, what was agreed in the negotiations and what are the next steps for disarmament in the Middle East. The United States helped launch Iran’s civil nuclear programme, supplying the country with a reactor fuelled by highly enriched uranium in 1967. Tehran subsequently announced plans to build many nuclear power stations in the country but work was halted following the 1979 revolution. By the late 1980s however, work on the nuclear power stations was re-started, with support from Pakistan, China and Russia. Iran has always maintained its nuclear programme is for peaceful purposes only. Some in the international community have doubted this position however, noting that the country is enriching uranium at a far higher level than is necessary for nuclear power and believing Tehran is actually covering up the development of nuclear weapons. The revelation in 2002 of undeclared nuclear facilities in Iran led to inspections by the International Atomic Energy Agency (IAEA) and negotiations with France, Germany and the UK. The Paris Agreement was signed in 2004, in which Iran agreed to suspend its nuclear activities. Cooperation broke down in 2005 however, leading to sanctions on Tehran and the country was referred to the United Nations Security Council (UNSC). Then President of Iran, Mahmoud Ahmadinejad, insisted on Iran’s sovereign right to develop its civil nuclear power capacity, ignoring further sanctions and UNSC resolutions and continuing to enrich uranium as well as building a heavy water production plant at Arak. Negotiations and further resolutions continued over the following years, with China, Russia and the United States joining the talks (who along with the original negotiators Germany, France and UK are referred to as P5+1). Tensions increased even further in 2009 when Iran announced it intended to build more uranium enrichment facilities. 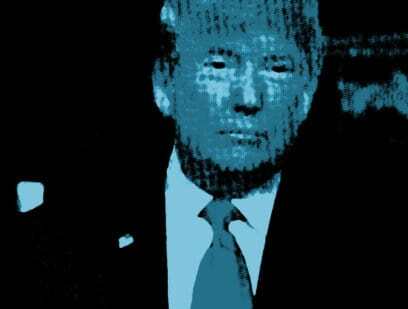 However, by 2012, US and other intelligence agencies broadly agreed that Iran had given up its nuclear weapons programme in 2003, whilst keeping options open for its redevelopment in the future – maintaining a position of ‘strategic ambiguity’. The situation changed following the election of a new Iranian President in the 2013 elections. Hassan Rouhani immediately announced his intention to work with the international community to ease tensions over his country’s nuclear programme. Following intense rounds of meetings, the Joint Comprehensive Plan of Action (JCPOA) was signed by Iran and the P5+1 in July 2015, with the UNSC approving the deal a few days later. Uranium can be used to make fuel for nuclear power plants, but it can also be used for nuclear weapons when enriched further. Iran will not enrich its uranium to a higher level than 3.67% and will reduce its current stockpile by 96% to 300kg, with the excess material sold on international markets, diluted or converted into fuel. Much of the negotiations concentrated on a heavy-water facility the Iranians have been building near the town of Arak. Spent fuel from a heavy-water reactor contains plutonium, which can be used to make a nuclear bomb. But Iran will now re-design the reactor, so that it cannot produce weapons-grade plutonium and have agreed not to build any more. The IAEA will take responsibility for monitoring Iran’s declared nuclear sites and will be able to request visits to any military site. The sanctions imposed in an attempt to stop Iran’s nuclear programme have devastated the Iranian economy. The agreement allows Tehran to sell oil to international markets and participate in the global financial system. A ban on Iranian students studying nuclear physics will also be lifted, as well as overseas assets unfrozen. On 16 January 2016, the IAEA issued a statement declaring Iran had fulfilled all of its obligations under the JCPOA, meaning international sanctions could start to be lifted. allowed the IAEA unprecedented access to sites in Iran. Iran is required to take further steps over the next eight years. If it does so, then all remaining sanctions will be removed. The outcome of these negotiations shows what can be achieved through dialogue and negotiation, even in the face of intense opposition. For over a decade we have heard voices urging attack against Iran over this issue. But fortunately, these calls were resisted and a constructive result has been achieved through peaceful methods. It is now crucial that we build on the success of this diplomacy and extend the principle of non-proliferation and nuclear disarmament to the whole region. There have been repeated UN resolutions calling for a Nuclear Weapons Free Zone in the Middle East, these should be honoured and acted upon with a conference convened immediately. It is important to remember that the only country in the region to possess nuclear weapons is Israel, which has weapons completely outside any UN inspections programme. The international community should now work to secure an end to any nuclear weapons in the Middle East at all.